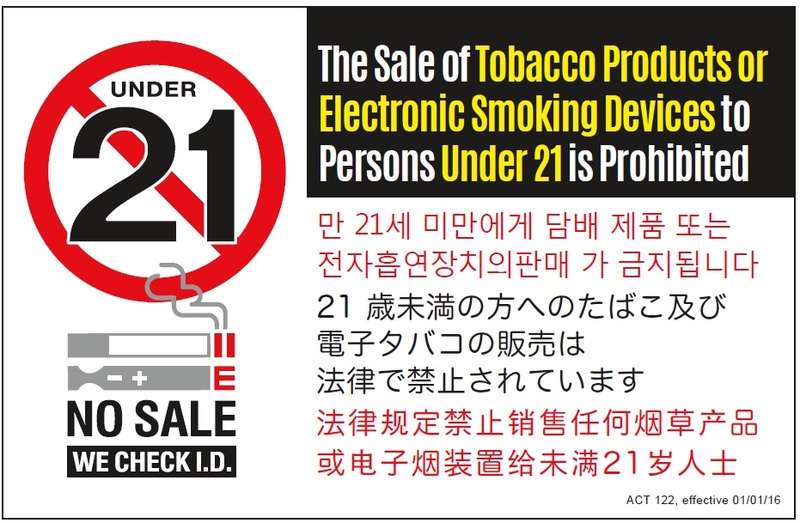 A new Hawaii state law effective January 1, 2016 increases the minimum age to 21 years for tobacco and e-cigarette sales. Make sure you’re prepared. 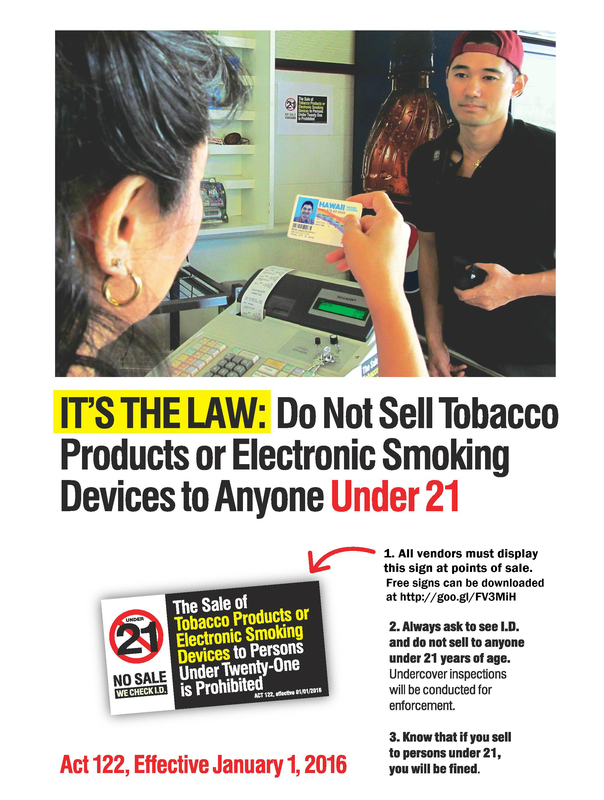 Know the law and post legal signage in your store. Information on the new law; Act 122. Korean, Japanese and Chinese language sign. 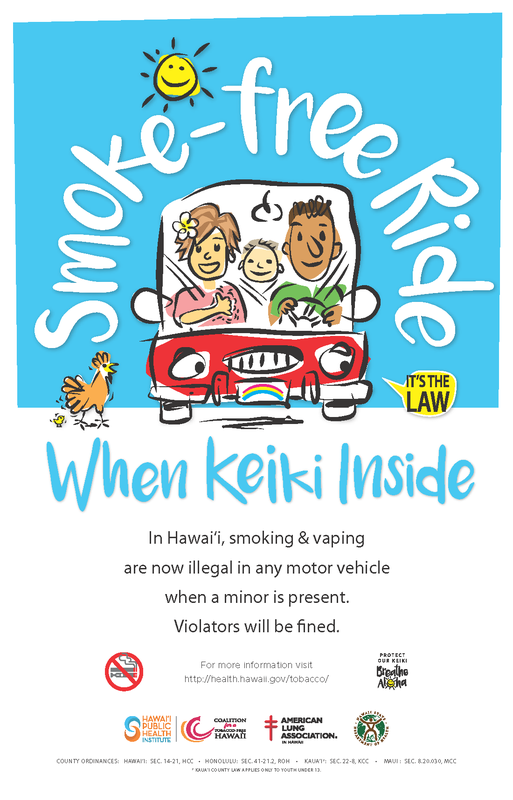 “Smoke-free Ride When Keiki Inside” poster. 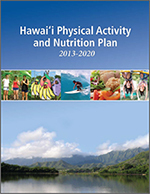 For more information please contact (808) 586-4613. Except as otherwise provided under this section, a retailer may sell cigarettes, smokeless tobacco, and all other tobacco products including electronic cigarettes only in a direct, face-to-face exchange between the retailer and consumer. It is unlawful to sell any of these to a person under 21 years of age. Examples of methods of sale that are not permitted include vending machines and self-service displays. “Tobacco product” means any product made or derived from tobacco that contains nicotine or other substances and is intended for human consumption or is likely to be consumed, whether smoked, heated, chewed, absorbed, dissolved, inhaled, or ingested by other means. “Tobacco product” includes but is not limited to a cigarette, cigar, pipe tobacco, chewing tobacco, snuff, snus, or an electronic smoking device. “Tobacco product” does not include drugs, devices, or combination products approved for sale by the United States Food and Drug Administration, as those terms are defined in the Federal Food, Drug and Cosmetic Act. “Electronic smoking device” means any product that can be used to aerosolize and deliver nicotine or other substances to the person inhaling from the device, including but not limited to an electronic cigarette, electronic cigar, electronic cigarillo, or electronic pipe, and any cartridge or other component of the device or related product. Not more than $500 for each additional violation within one year of the date of the preceding violation. A person who owns, manages, operates, or otherwise controls any place or facility may result in the suspension or revocation of any permit or license issued to the person or the place for the premises on which the violation occurred. Each day on which a violation of this chapter occurs shall be considered a separate and distinct violation. 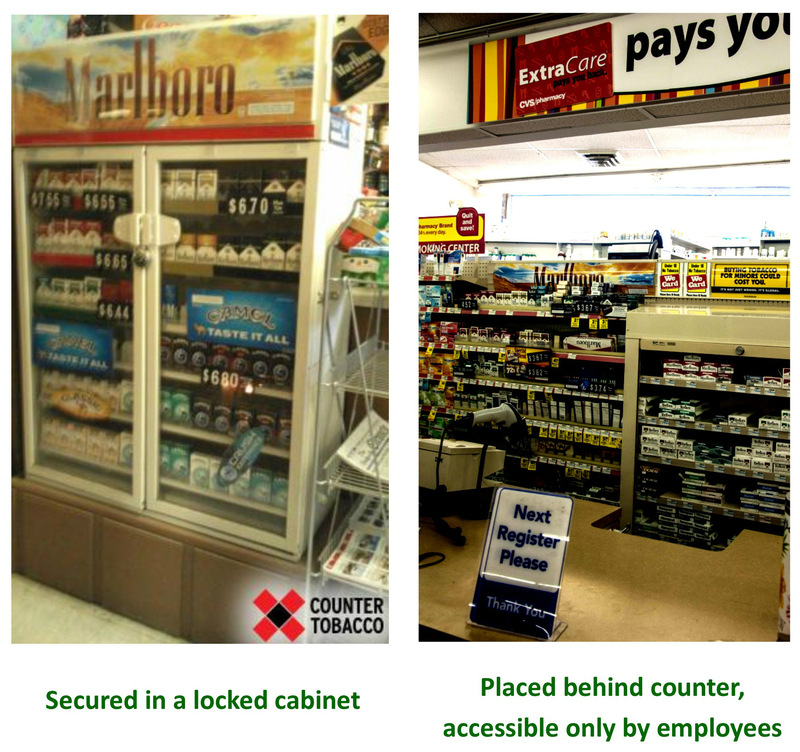 Reuse existing displays by locking them and limiting access to employees only.